If you ask Jam Lachica, 12, a young girl and an avid basketball player, how she ended up being selected among 800 players during the Jr. NBA Philippines presented by Alaska Regional Selection Camp, Jam will tell you right away that it was because of her coaches, including her dad Jaylord Lachica and school coach Joseph Rizos. As a budding athlete, Jam was always influenced by her father’s interests, including basketball, which led to her love for the sport. Since the age of six, she would tag along with her father’s barangay leagues and closely observe the game. “Lagi akong sinasama ni Papa sa mga laro niya, kaya ginusto ko na rin matutunan yung basketball,” she said. Fast forward to 2016 when Jam first joined the Jr. NBA Regional Selection Camp wherein she competed with several skilled female players her own age. However, she missed her chance to progress to the camp’s second day after she left to support her dad’s championship game in Quezon City. But just like a true champion, Jam got back up and tried again in 2017. Knowing that she had been chosen on her first try, the shooting guard had a little more confidence, but unfortunately, she failed to make the cut. “Ginawa ko naman yung best ko para makuha ako ulit kaso madaming ibang magagaling,” she said. Jam admits to feeling disappointment and in fact, did not consider joining this year’s camp. However, her dad didn’t lose faith and together with coach Rizos encouraged her to join again. 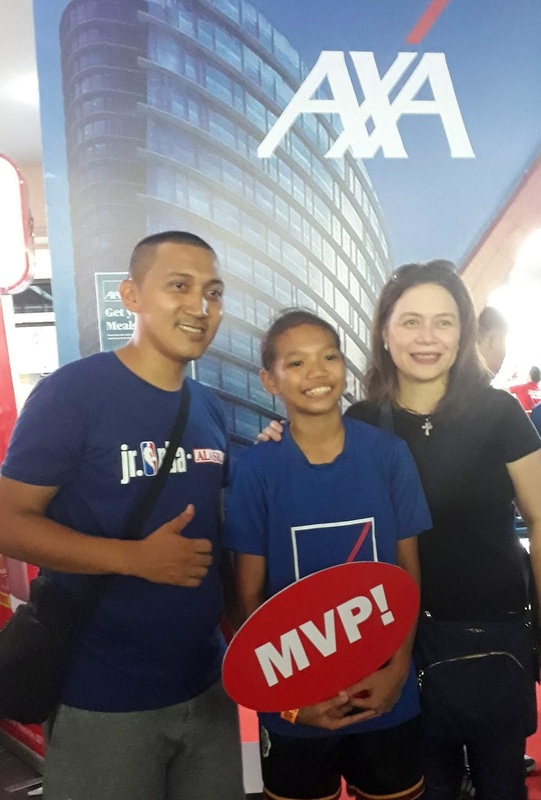 Surprisingly, 2018 seemed to be Jam’s lucky year – with the help of AXA, the official insurance partner of the NBA in the Philippines, she had the support that she needed to succeed. Jam was selected as one of the 16 girls that would represent Metro Manila and compete with peers from the provinces at the National Training Camp. All the hard work and long training hours were worth it. “Sobrang saya at thankful ako na may na-meet akong coach na nag-motivate sa akin to do my best. Buti nalang nandiyan si Papa para bigyan ako ng pag-asa,” she said. After all, third time’s the charm. With AXA providing proper coaching and support, along with her father and coach’s help, she is now one step closer to reaching her dreams. “Si Papa ang best coach ko. Basta nandiyan siya, kaya kong abutin yung mga pangarap ko,” she said. AXA Philippines, one of the country’s leading insurance companies, empowers people to live better lives by encouraging them to have a game plan, whether it’s in sports or in the hard court that is life. AXA believes that preparing for the future is important so that people can live the life they choose. For more information on AXA’s wide array of life and general insurance and investment products, visit www.axa.com.ph.